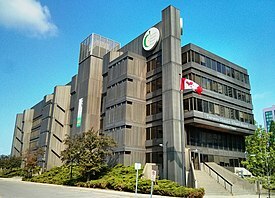 The headquarters for Toronto District School Board, the largest school board in Canada. Toronto is the most populous city in Canada and the provincial capital of Ontario. The city is home to a number of elementary, secondary, and post-secondary institutions. In addition to those institutions, the city is also home several specialty and supplementary schools, which provide schooling for specific crafts, or are intended to provide additional educational support. Four publicly funded school boards provide elementary and secondary schooling to residents of the city, from Junior Kindergarten to Grade 12. The four school boards operate as either English or French first language school boards, and as either secular or separate school boards. In addition to publicly funded schools, elementary and secondary education is also provided by private religious school boards, independent religious schools, or independent secular institutions, such as college-preparatory schools. Toronto is also home to a number of post-secondary institutions. There are five universities in Toronto with degree-granting authority, four of which are public university, while the other is a private seminary. In addition there are four degree- and diploma-granting colleges based in the city. Other post-secondary institutions based in Ontario have also established satellite campuses in Toronto. Other forms of post-secondary institutions in Toronto consists of private vocational schools. Four school boards in Toronto provide public elementary, secondary, and adult education. The four school boards operate as either English or French first language school boards, and as either secular or separate school boards. The number of school boards based in Toronto, and the kinds of institutions that they operate are a result of constitutional arrangements found in the Constitution of Canada. Separate schools in Ontario are constitutionally protected under Section 93 of the Constitution Act, 1867, and is further reinforced by Section 29 of the Canadian Charter of Rights and Freedoms. French language schools in Toronto are also constitutionally protected under Section 23 of the Canadian Charter of Rights and Freedoms. In 1980 there were 7 French schools (secular and separate) in Metropolitan Toronto. Maurice Bergevin, the vice principal of the Etienne Brule School, stated that a study from Montreal in 1971 stated that if francophones in Toronto had the same proportion of schools that anglophones had in Montreal, there would be 31 francophone schools in Metropolitan Toronto. According to a 1971 Canadian federal census, Toronto had 160,000 francophones. The number of French first language schools in Toronto has since grown to 26 (secular and separate). Several alternative schools in Toronto are also operated by Toronto's public school boards. The oldest is ALPHA Alternative School, which opened in 1972. The first conference for publicly funded alternative schools in the Greater Toronto Area happened in Nov, 2012. Conseil scolaire Viamonde is a French first language secular school board headquartered in Toronto. Headquarters for the Toronto Catholic District School Board, the city's English-language separate school board. The following public school boards operate separate schools in Toronto. 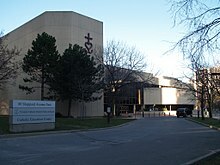 Prior to the amalgamation of Toronto in 1998, English and French separate schools in Metropolitan Toronto was managed by the Metropolitan Separate School Board (MSSB). 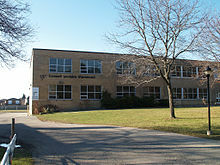 French separate schools in Metropolitan Toronto were operated by Les Conseil des écoles catholiques du Grand Toronto, a board that was a part of MSSB. In 1998, MSSB was reorganized, with its English and French components split. MSSB's English component formed TCDSB, whereas its French component merged with several other French separate school boards in the Greater Golden Horseshoe to form Conseil scolaire catholique MonAvenir. Upper Canada College in Toronto. Founded in 1829, it is the oldest independent school in Ontario. Toronto Academy was a former secondary school located on Front Street between Bay and York Streets and had ties to Knox College, Toronto. Established in 1846 as an alternative to provincial schools, it severed ties with Knox College in 1849, and was closed shortly afterwards in 1852. William Lyon Mackenzie's son, future Chief Justice Thomas Moss as well as first African Canadian doctor Anderson Ruffin Abbott. Toronto is home to a number of post-secondary institutions, including colleges, and universities. 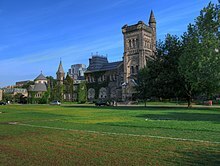 The University of Toronto is one of several universities located in the city. There are five universities located in Toronto. Three universities are located downtown, OCAD University, Ryerson University, and the University of Toronto. The University of Toronto also operates two satellite campuses, the University of Toronto Scarborough, located in the eastern portion of the city, and the University of Toronto Mississauga, located in the neighbouring city of Mississauga. The other two universities, Tyndale University College and Seminary, and York University, are based in an area of the city known as North York. York University maintains three campuses, two in North York, and one in the neighbouring city of Markham. Four of the five aforementioned universities are public degree-granting institutions. Tyndale is the only private university in Toronto that has degree-granting authority, being a Protestant seminary. In addition to these five institutions, the city is also home to the University of Guelph-Humber, a collaborative institution between the University of Guelph (based in Guelph, Ontario), and Humber College (a college based in Toronto). Guelph-Humber is not an independent institution, and does not have the ability to issue its own degrees. Guelph-Humber acts as a satellite campus for its parent institutions, and its graduates are awarded degrees/diplomas from either the University of Guelph or Humber College. In Canada, the term college typically refers to a technical, applied arts, or applied science school. Four colleges have their principal campuses located in Toronto, Centennial College, George Brown College, Humber College, and Seneca College. In addition, the city is also home to the satellite campus for Collège Boréal, a college based in Sudbury, Ontario. From 1995 to 2001, the French first language college, Collège des Grands-Lacs, operated in downtown Toronto. Following its closure in 2001, Collège Boréal assumed control of Grands-Lacs facilities, maintaining it as a satellite campus for the institution. Overall, the five colleges operate 29 campuses spread throughout the city. The Royal Conservatory of Music is a non-profit music education institution headquartered in Toronto. ^ "Toronto has 7 public schools for French-speaking children." The Canadian Press (CP) at Montreal Gazette. Wednesday May 21, 1980. p. 66. Retrieved from Google News (66 of 141) on July 24, 2013. ^ "Etz Chaim". Retrieved 21 November 2013.